Young Friends and Young Adult Friends (13-35 age range) gathered this summer at Camp NeeKauNis for a weekend of fellowship and fun. The following is their epistle. The gathered Young Friends ask this epistle be read during announcements after Meeting For Worship. From 29th Sixth Month to 2nd Seventh Month 2017, around 30 Young Friends from across the country gathered at Camp NeeKauNis in Waubaushene, Ontario for a Canadian Young Friends Gathering. This gathering was organized to bring together a critical mass of Young Friends and Young Adult Friends in order to energize and strengthen our community and rejoice in our time together in worship, play, and good conversation. This gathering was planned in part so that Canadian Young Friends and Young Adult Friends had an occasion to gather while the wider Canadian Yearly Meeting sessions were holding a fallow year, and also as a pre-retreat for the Friends General Conference Gathering happening in Niagara Falls, New York. Along with meals together, work around the camp, and daily meeting for worship, the organizers left space for Friends to offer self-directed programs as they desired. These smaller sessions sprung from the amazing diversity of gifts Friends wanted to share, from the gentle art of cat’s cradle to discussions of the role of Christ in our lives and in Quakerism; from canoeing at sunset, to the plenary workshop on the surprisingly recent history of Christian homophobia and transphobia. Several Friends noted this year’s gathering at Camp NeeKauNis was the largest gathering of Canadian Young Friends in some years. This is with great thanks to the committee (Rachel Urban-Shipley, Jonah Egan-Pimblett, Misia Robins, David Summerhays, Jessica Klaassen-Wright and Christina Tellez) who organised and promoted the gathering, especially the leadership of Jessica and Christina before and during the event. We are also deeply grateful for the support of Education and Outreach for assisting with funding for the gathering, particularly as travel costs are often a barrier for Young Friends who wish to attend. 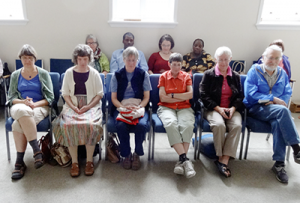 In the midst of this gathering, Friends also felt led to discuss the future of Canadian Young Friends Yearly Meeting and its relationship with Canadian Yearly Meeting. 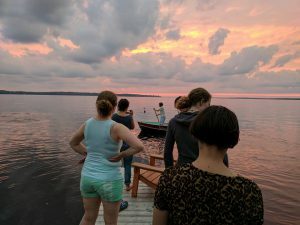 Those of us at the Canadian Young Friends Gathering discerned a need and have a strong desire to focus on building our whole community of Young Friends (13-35) especially as the official body of Canadian Young Friends Yearly Meeting is on hiatus. 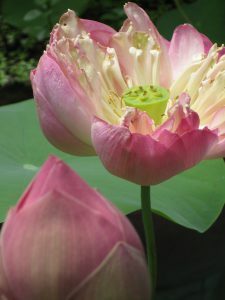 The current hiatus was chosen because of the a small number of Young Friends attending Yearly Meeting sessions and the difficulty of filling official roles. We are excited about re-kindling the enthusiasm and spirit in Young Friends by growing our connections with each other, both through media and regular gatherings. The gathered Young Friends recognise the role effective communication provides in building and maintaining community. Both Reykia Fick, The Canadian Friend Editor, and Cameron Fraser, now the Canadian Yearly Meeting Secretary, were present at the gathering, and several discussions took place regarding possible ways Canadian Yearly Meeting paid staff and contractors may be able to assist Canadian Young Friends in connecting, communicating, and gathering. Gatherings are a crucial component in maintaining and strengthening the dispersed community of Canadian Young Friends. Those of us present felt a desire to maintain and increase these gatherings. Recognising this, we encourage all Young Friends who are able to attend Canadian Yearly Meeting in Barrie in 2018. 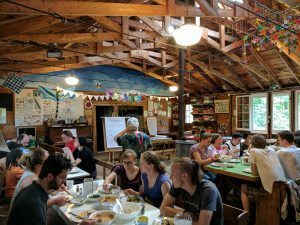 The gathered Friends will investigate the possibility of a Young Friends pre-CYM gathering at Camp NeeKauNis in 2018. With this epistle, the gathered Young Friends send Lilia Fick, David Summerhays, and Daniel Von Schulmann to Representatives Meeting hosted by Ottawa Monthly Meeting this fall as representatives of Young Friends. As part of establishing more efficient, effective, and meaningful communication within the Canadian Young Friends community, and between Canadian Young Friends and Canadian Yearly Meeting, the following regional contacts were established. These contacts will work with Canadian Yearly Meeting staff to facilitate this initiative. Canadian Yearly Meeting Secretary, Cameron Fraser, has invited Young Friends into a discussion to assist in creating goals as to how he can best help Young Friends in Canada. This is an open invitation to all Canadian Young Friends who wish to be involved. The regional contacts committed to involvement in this process of goal setting. Any interested Young Friends may contact Cameron Fraser at cym-secretary@quaker.ca for more information. As we build our community, including through further gatherings, we request the continued support of Yearly Meeting’s Education and Outreach Committee. The challenges of holding gatherings are amplified for Young Friends. We are grateful for the support of all those in Canadian Yearly Meeting in dealing with those challenges and in helping us strengthen our common community. Facilitator(s): David Summerhays (Montreal Monthly Meeting) and potentially a new facilitator* if registrations warrant! Friends across Canada are invited to participate in online courses that will begin September 2017 and January 2018. Both courses are tentatively scheduled to take place in September and January, but are dependent upon interest (registrations) and the availability of instructors. Registrants are asked to choose their ideal dates and course(s) of preference when registering, which will assist Education and Outreach Committee with scheduling the courses. The course will address the early history of Friends, the history of Friends in Canada, the experiential nature of Quaker faith, the role of the Meeting in Quaker life, Quaker testimonies and their origin, and how our Quaker community nurtures how we live, work, worship, and transact business. This course was previously offered in 2012, 2015, 2016 and 2017. This course explores the experiential understanding of Quaker faith and practice, as presented in the foundational book Faith and Practice of the Canadian Yearly Meeting of the Religious Society of Friends, first published in 2011. David Summerhays of Montreal Monthly Meeting, adapted the original course into an online course in collaboration with the authors. The course was originally prepared by Marjory Reitsma-Street, with assistance of Gale Wills and Catherine Novak, all Friends living in Victoria, B.C. Marjory and Gale have doctorates from the University of Toronto, and are retired Professors in Social Work. Gale has served as clerk in local and national Quaker committees, while Marjory has concentrated on music and other service close to home. Catherine recently completed a Masters in Interdisciplinary Studies, works in digital marketing and communications (in addition to being a mother), and is currently serving on the Canadian Yearly Meeting Publications and Communications Committee. Participants will be asked to do a short reading before each of the sessions. These readings can be viewed anytime at the Quaker.ca Education Page under ‘Introduction to Quaker and Friends’ Ways’ and ‘Quaker Faith and Practice’. The course will include worship, active exercises, reflections from readings, and the application to one’s own life of what is learned. The course is free of charge. To indicate your interest: please click here to register. The registration process (including a availability poll) will assist us with determining the course times. CYM warmly welcomes any donations you are able to give. Canadian Yearly Meeting, 91A Fourth Ave, Ottawa ON K1S 2L1. To donate by credit card, call the CYM office at 1-888-296-3222. *E&O is currently seeking and reviewing applications for people interested in facilitating these already well-seasoned courses. Interested persons are welcome to send a cover letter and resume to cym-secretary@quaker.ca with the title “E&O Online Course Contractor” in the subject line. Registration is now open for Friends wishing to attend this year’s annual ‘Quaker Study’ session hosted by Ottawa Monthly Meeting on October 13-15. This year’s workshop, ‘Palestine-Israel, Nonviolence, and F/friends,’ is facilitated by Maxine Kaufman-Lacusta. All Friends are invited to attend a weekend-long Quaker Study workshop hosted at the Ottawa Meetinghouse. 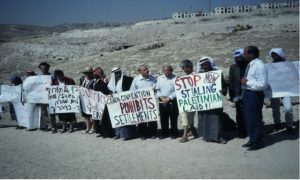 The workshop will explore historical and ongoing Palestinian nonviolent/ popular resistance, and support/ involvement by Israelis and by Quaker, Jewish, and other international organizations. “The weekend will focus on experiences – ours and those of Palestinian, Israeli, and International activists – through film, unpublished interview excerpts, and personal sharing… and explore our own responses to the query, ‘Friend, what cans’t thou do?’” explains Maxine. Workshop costs are covered by Education and Outreach Committee and there will be billeting available for Friends to attend. Quaker Study is normally held at Canadian Yearly Meeting gathering and is this year being hosted by Ottawa Monthly Meeting. Monthly Meetings and Worship Groups are asked to please share information about the workshop with members and attenders. The deadline for registration is September 30th. The event poster includes is a detailed workshop schedule.